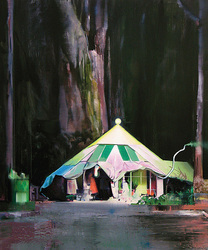 Camp Site by David Ralph from his recent exhibition at Gallery 9 will feature in Sublime Point: the landscape in painting, curated by Carrie Kibbler and Grahame Kime at Hazelhurst Regional Gallery and Arts Centre. The landscape has been a significant aspect of Australian painting and continues to resonate in our consciousness metaphorically and as a presence, backgrounding a range of concerns and experiences for artists and the broader population alike. Sublime Point: the landscape in painting will demonstrate a wide variety of approaches to and uses of landscape in contemporary painting with some interesting intersections as well as differences. This exhibition intends to show how artists are featuring landscape in their work as a signifier for aesthetic and cultural issues and understandings. Artists in the exhibition include, Churchill Cann (WA), Tony Clark (ACT/Italy), Sally Gabori (QLD), Daniel Boyd (NSW), Noel McKenna (NSW), Imants Tillers (NSW), Neridah Stockley (NT), Caroline Rannersberger (TAS), Stephen Bush (VIC), David Ralph (VIC), Mark Rodda (TAS/VIC),Paul Ryan (NSW), Kate Shaw (Vic), Joanna Lamb (WA), Chris Langois (NSW), George Tjungurrayi (NT), Tjala Women’s Collaborative (SA), Amber Wallis (NSW), Oliver Watts (NSW), Philip Wolfhagen (TAS). July - The Arthur Guy Memorial Painting Prize - Finalists Exhibition, Bendigo Art Gallery,Victoria. 2014 Residency - LIA Leipzig International Art Programme, Leipzig, Germany. - 2011 'Bohemian Rocket Science' Finalist, The Albany Art Prize at the Albany Art Gallery in Western Australia. I'm interested in the way environment, cities and dwellings shape our minds and our identities. I'm drawn to the psychology of architectural spaces, their atmospheres and surfaces, be they slick and shiny or worn and dilapidated. I'm curious about what these ostensibly man made structures are telling us or what they reveal of their past. Over the past few years I’ve been particularly interested in painting dwellings and environments beyond the city that focus on what might be called an 'Architecture of Escape' - escape from cities or various forms of captivity to re connect with the natural world. I've painted unusual or alternative dwellings such as mobile homes, caravans, tents, cabins, tree houses, and self sufficient 'Green' dwellings known as Earthships - in a variety of natural scenarios. I find the spaces and surfaces of our surroundings a useful metaphor for the mind and body. I'm intrigued by the fact that we make clothes, artificial structures and screen based environments to surround ourselves, but often in contradiction and conflict with the environments of every other living thing. I like to create pictorial scenarios where man made structures and natural environments clash or overlap and question the threshold of reality and our priorities. Lately I've been exploring what I call 'Escapist Environments' or destinations via what I suggest are the 'Digital Day-Dreams' of online escapist imagery. We are visually immersed in screens and favourite web sites much of the time now. Whereas we may have been in and out of our books, personal visions and our imagination in the past, our personal day dreams and curiosities have never been more easily satisfied than they are now online. I also find contradictory surfaces or man made surfaces a useful metaphor for Contemporary Painting and it's vacillating critical perceptions as an old and new, dead and alive, fashionable and un-fashionable medium. I find it a useful medium for rendering the physicality of slick and textured surfaces. Painting like Drawing is for me an enduring medium for the realisation of hybrid abstract, representational and visionary scenarios. The recipient of a 2000 Anne and Gordon Samstag International Visual Arts Scholarships, David Ralph traveled to England at the end of 2000 to study in the Masters program at the Chelsea College of Art & Design in London. Ralph spent four years in London and has held numerous exhibitions nationally and internationally. He is represented in several public collections in Europe and Australia and has been the recipient of many awards. In the last few years he has been a finalist in the Celeste Contemporary Painting Prize, London, the Archibald Prize, The Geelong Contemporary Art Prize and the past four consecutive Arthur Guy Memorial Painting Prizes, amongst others. ‘Threshold’ is an exhibition of seven medium-large paintings by a painter in the prime of his powers. Graduating from the VCA in 1985, Ralph has been painting for 25 years and it shows. It shows in his confident drag and smear. It shows in the finesse of tonal gradations and leaps in contrast. In the flaring of a picture’s kaleidoscopic colours, and the subtle monochromes of the facing picture. It shows in the masterly brushing of feet and car bodies, the deceptively effortless dotting and gridding of light sources on dark backgounds. It shows in the exacting blade-sharp edge of paint along some of the shapes. And something else that’s not a result of sheer practice: what comes right out at you is the sheer joy of paint. This is a painter who loves his material, and it shows. The paint exhilirates; the images make the familiar strange. (death to cliches) I mean, the images make what is familiar, strangely familiar. The juxtapostions of the picture elements seem irrational and arbitary, but the placements are punchily precise. This is fine hand-eye coordination working to a tuned instinct. A threshold is “the starting point for a new state or experience.” According to the artist, all these slippages of time and scale, of place and moods, are about “a longed for natural paradise.” Well, I have no idea how paradise looks, unless it’s like Byron Bay, but David Ralph’s dislocations are fascinatingly unsettling. The compositions all have a classical poise and his craftsmanship is of a very high order. The pictures don’t look like any place I’ve been — or rather, look like bits of many places, but all at once. And they don’t look like anything anyone else is doing. Do we have to ask what they are “about”? I can only say that they are suggestive, memorable, and, that contemporarily problematic B-word, beautiful. The more I look, the more I like even the ones I hadn’t. With such painterly paintings, it’s all in the looking — pace Sontag — rather than talking. This is art by an artist stretching and taking pleasure in his abilities, aimed at paradise, at infinity. Why not? It’s the furthest boundary, the grandest target. NOW! In every painting, you'll discover inspirational success stories. See dramatic before and after pictures of projects large and small. From simple treehouse re-dos to complex museum add-ons and chalet facelifts, and more! David Ralph’s modest show in Arc One’s second gallery space is a small triumph of imagery and painting. The bizarre scenes of unlikely architectural extensions are fascinating enough but his virtuosic use of paint is for me the real subject of this show. Ralph’s broad vocabulary of mark making from soft moody blended backgrounds to thick swathes of impasto and even scratches that go right back to the canvas are extensions of painting itself. Merely describing the things Ralph depicts would fail to convey the presence of these works. For example, Juggernaut shows a rudimentary treehouse with a blurred image in the doorway (the empire state building? ), an upside down Duchampian urinal and city lights in the background. What does all that add up to? I have no idea, but the overall effect is so exciting and unexpected that it rouses me to wonder what it could mean... could it be the Central Park nest of a homeless art collector? 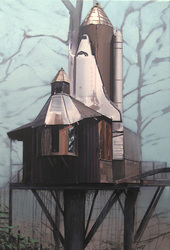 Bohemian Rocket Science reveals another shabby arboreal domicile this time with the addition of a space shuttle. The pointed treehouse roof is echoed and magnified by the shuttle’s nose cone and booster rockets and the resulting image aspires to represent a post-apocalyptic Chatres. Ralph’s muted palette, sparse brush strokes and subtle use of drips collude to produce an air of North European winter. The end product is a curious evolutionary take on Caspar David Friedrich’s forest churches. A Chalet near Tokyo and the charmingly titled Harry Potter and the New Museum Extension are further examples of the peculiarity of David Ralph’s imagination and his command over the plasticity of paint. You can spend some time looking at these paintings, the detail slowly reveals more and more of itself to you as you stand there wondering whether a treehouse dreamt it was a museum or a museum dreamt it was a tree. Dale Hickey: Life in a Box Ian Potter Museum, Melbourne, until April 27. David Ralph Arc One Gallery, Melbourne, until March 8. Del Kathryn Barton Karen Woodbury Gallery, Melbourne, March 5-April 5. 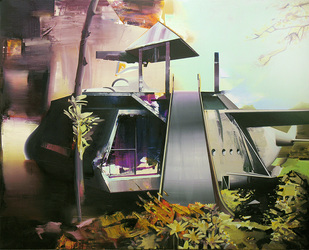 Benjamin Armstrong Tolarno Galleries, Melbourne, until March 15. Sebastian Smee - The Australian — Art Review 2008 An extract re “In Captivity” exhibition 2008, exhibition at Arc One Galley Melbourne. “Richter is winked at in a painting called Gerhard's Retreat by David Ralph at ARC One Gallery on Flinders Lane in central Melbourne. 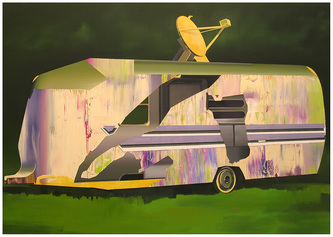 Ralph's show, easily the most compelling of a crop of painting exhibitions in Melbourne right now, is called Mobile Home, and it consists of a series of small figurative paintings that riff on the theme of caravans and other types of mobile home. It's an extremely sly, self-conscious show, and its real subject may simply be the strange business of representing things in paint. Before now, Ralph, who was brought up in Melbourne and returned from studying in London 18 months ago, painted urban images in a beguiling but rather slick photo-realist mode, using a lot of blurred imagery suggestive of alienation in the manner of Richter. He has since switched to a more "painterly" approach; he's more interested, in other words, in manipulating paint to achieve effects that are unique to the medium, than in imitating photographic effects. And yet his approach is full of wit and verve, dazzlingly alive to the tension between abstraction and figuration and packed with tautologies, art historical in-jokes and assumptions turned on their heads. In their combination of painterly wit and conceptual mischief-making, if not in their look, they are reminiscent of the work of brilliant young painter Matthias Weischer. Mankind once lived amidst nature. Today interaction with nature for most of us is, at best, a potted plant. As we have moved away from natural environs our indifference to flora and fauna has grown apace, to a point where it is only recently that we have become aware that this indifference could well be truly catastrophic. That is where a somewhat chilling aspect comes into David Ralph’s most recent body of work. In his past work Ralph has utilised such images as the caravan as a metaphor for escape, for a return to nature or, at the very least, a brief stint of living away from urban madness. In his most recent works even the caravan has been enclosed; an odd, alien thing that once resided in the bush has been transported into the museum, an artefact of the days that one could venture into the hills and enjoy some fresh air. It is tempting to view these paintings as museum dioramas from 3008 where those still surviving could be told about the archaic notion of escaping the grid. The caravan has been dredged from a swamp and reconfigured in the museum a thousand years later to replicate the notion of sitting under party lights in deck chairs as a now extinct insect called a cicada chirped away. In much the same way that museums today replicate the environs of our primordial ancestors these dioramas would seem fantastical. Those in the future will titter nervously about how their ancestors of 2008 could live in such conditions, with so much green stuff around, so much moisture! become another victim of degradation. Ralph’s tent hurtles through the air, starting as an abstraction before finally grounding itself as a shelter. His tent acts as a metaphor for the abstract idea of a journey or a camping trip before it becomes a reality, but in its illustrative depiction it also becomes a thing of nostalgia, or of the trip not taken, the opportunity lost. And by 3008 the opportunity has been lost forever. Even Ralph’s boat, like his tent and caravan, is a thing of quirky fascination, placed like a prized relic in a corporate foyer, again a thing of the past, never to float again.In one of the most surreal and quirky images in this museum we witness the domicile of a wealthy woman from 2060 (these are my dates, David Ralph will no doubt be totally bemused by this entire fabrication). Titled At A Safe Distance she stands in a gutted or incomplete apartment building, her attire, pure haute de’coutre, her actual home. She scans the horizon, searching for threat, either towards her fashion status or her overall environment. Behind her, framed by pitted and scarred concrete, a toxic fog veils the landscape. It is an image worthy of a post-apocalyptic J.G. Ballard novel. 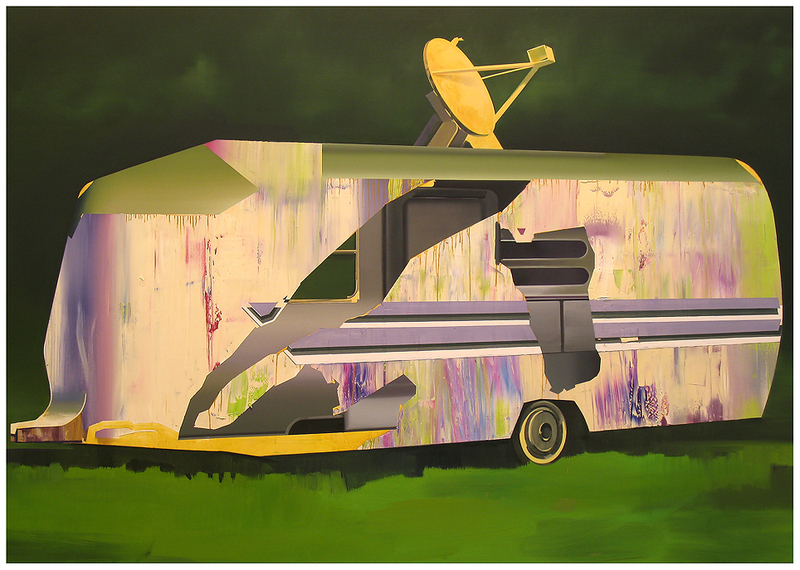 For Ralph his caravans, tents and even attire are vehicles of escape and the fantasy of freedom. His mis en scenes are reminiscent of the strange portal in the 1999 film Being John Malkovich (one of the artists’ favourite films) in which, for a small fee, one can be inserted into the film-star’s life. Of course, as with the fantasy of a weekend in the bush, things are rarely what we hope for. Malkovich’s life is banal, as is the reality of rain and mosquitoes on a camping trip. Yet despite that we still yearn for a different environment and these are indeed images of yearning for tranquil settings, bordering on melancholia but not without a degree of gallows humour. There is the very real sense that these other environments are disappearing. In these works the indoors become outdoors, the exteriors become interiors – we are both out in the wild and safely secured inside; unnatural voyeurs of the natural. Ralph’s paintings are somewhat reminiscent of the final scenes of the 1972 film Silent Running in which Earth’s last remaining forests are secured in greenhouse-like geodesic domes outside the orbit of Saturn. It is hoped to return them to an apparently barren Earth in order to reforest the planet, but such a plan becomes economically unfeasible and the resident botanist, played by Bruce Dern, is ordered to destroy the forests. He refuses and manages to jettison one dome to safety, dying in the process. In the sequel, released in 3008, the botanist is played by David Ralph who is trying to secure the dying traces of a fore-gone world.